Jabhat Al-Nusra terrorists have pitched their camps right next to the border and receive regular supplies from the Turkish side, Syrian Kurdish forces told RT’s Lizzie Phelan, who traveled with YPG to investigate suspicious activity there. An RT crew has filmed a number of vehicles coming through the Bab al-Salam crossing on the Turkish-Syrian border, on the outskirts of the northern town of Azaz, which is partially controlled by Al-Nusra, according to reports. “We can actually see here the important border town of Azaz, that Turkey is determined to prevent YPG from taking. Just a little beyond that you can see the Bab al-Salam border crossing and a heavy flow of vehicles coming from Turkey into Azaz,” the RT correspondent said, reporting from the Turkey-Syria border, an area that TV crews rarely gain access to. “When we zoom in we can see Turkish military vehicles, probably around a kilometer away, maybe less. 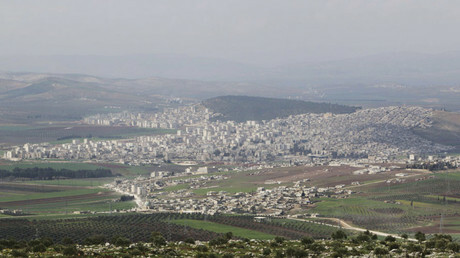 And just in front here's another small village that YPG say Al-Nusra uses for training,” Phelan said. According to the Kurds, after the terror group was excluded from the ceasefire, Al-Nusra have taken down most of their flags, which would give their location away and invite airstrikes. However, the RT crew still managed to film some flags flying above their positions. YPG are unequivocal about Turkey’s sponsorship of terrorist groups in Syria. Head of the YPG in Afrin, Abdu Ibrahim, says Turkey is definitely providing support for terrorist groups in the area. “Turkey wanted to make a coalition against terrorism, but any country which would be in a coalition against terrorism should not open its border to Al-Nusra Front,” he said. Abdu Ibrahim also said that some of the corpses that they found on the battlefield "that belong to Al-Nusra Front were of Turkish origin and we even found IDs and passports. And the ammo we found in their warehouses - closed boxes of ammo - they were closed and stamped by the Turkish government. We even found clearance documents to allow [the boxes of ammo] cross the borders which proved that they were approved to cross the borders." Ankara says its direct strikes against the YPG are justified due to its links with the Turkish-based militant group the PKK, which Turkey has recently resumed its war against at home. 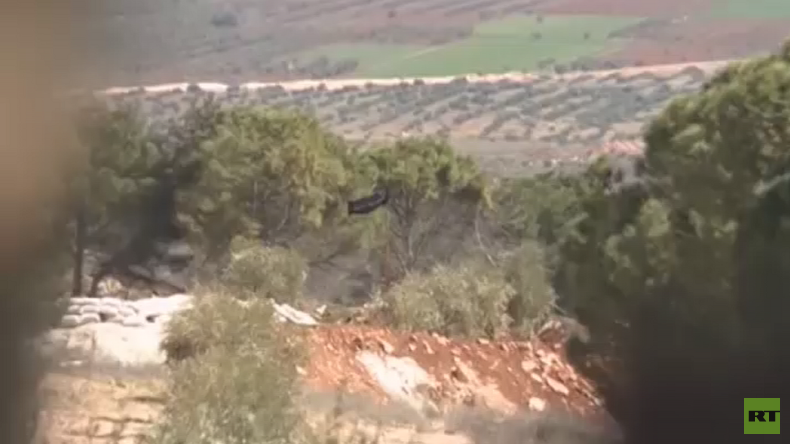 The rebel fighters on the ground say they are certain Turkey is providing assistance to IS, Al-Qaeda and Al Nusra. “The reason Turkey is on the ground is to support groups like Al-Qaeda. Support for ISIS is coming from Turkey. They are shelling because it wants to occupy our land, not to help our people. Turkey dismissed many of the armed groups, and supported Al Nusra against us,” Abu Jouma Benawii, a general in the FSA and co-founder of Jaish al-Thuwar (Army of Revolutionaries), told RT. “Our fronts against the regime have stopped, but our fronts against ISIS are going on and against Al Nusra as well. We are committed to the ceasefire, one million percent,” he added. Asked if he would have changed his mind about joining the uprising, Abu Jouma Benawii said in hindsight: "Really I would have changed my mind, because everybody contributed to destroying Syria, at the beginning and the end it is only the people who lose." “Had we known that Syria’s friends would be like this, we wouldn’t have been with them. All our people were forced to flee," he added. “On the contrary, this has to do with the will Turkey shows to protect its sovereignty rights,” Erdogan added. Turkish forces have been shelling YPG, which Ankara considers a terrorist organization, as well as government army positions in Syria, since mid-February. The bombings of YPG targets, the military wing of the Democratic Union Party (PYD), have been underway despite the US, Ankara's ally, viewing the Kurdish fighters as a vital partner in fighting Islamic State (IS, formerly ISIS/ISIL). There were reports of dozens of Turkish military vehicles crossing into Kurdish northern Syria, with servicemen digging trenches in the area. Turkey’s “provocative” military buildup on the border and shelling of the Syrian territory could thwart the fragile truce and disrupt the peace process in the Arab Republic, the head of the Russian ceasefire monitoring center Lt. Gen. Sergey Kuralenko said this week. The ceasefire in Syria, which came into force on February 27, brokered by leading world powers, including the US and Russia, is designed to pave the way to reconciliation between the Syrian government and moderate rebel forces. They would together agree on a peaceful transition in the country. Some of the forces in Syria, including IS and Al-Nusra, are not subject to the ceasefire. Experts have been criticizing moderate rebel forces, but even they think that the situation is shifting now. Moderate rebels used to be “a fable, a pure lie,” Syrian political analyst Taleb Ibrahim told RT. “Everyone remembers what happened to the rebels who had been trained in Turkish camps by the CIA, and when they returned to Syria, and turned to Al-Nusra Front”. Russian aircraft continue to carry out airstrikes against Al-Nusra front militants to “stabilize the situation” in the regions north of the city of Aleppo, the Russian Defense Ministry said in a statement. There have been at least 31 violations of the Syrian ceasefire over the past three days, Russian Foreign Ministry spokeswoman Maria Zakharova said on Wednesday, adding that during the same period the number of local ceasefire agreements between various factions had increased to 38.